Today, an estimated 1.2 million Americans have HIV. In 2016, the South accounted for more HIV diagnoses than all other regions (Northeast, West and Midwest) combined, representing 52 percent of all HIV and AIDS diagnoses in the U.S., according to the Centers for Disease Control and Prevention. This World AIDS Day (Dec. 1), WellFlorida recognizes the personal losses due to HIV and our commitment to fight the spread of the disease. In 2017, HIV was the 8th leading cause of death for people ages 25-44 in Florida, according to the Florida Department of Health. Currently, Florida has 116,944 people living with an HIV diagnosis. At the end of 2017, 1 in 49 black adults were living with an HIV diagnosis in Florida compared to 1 in 155 Hispanic adults and 1 in 295 White adults. The highest proportion of adults who received an HIV diagnosis in 2017 (61%) had male to male sexual contact or MSM as their mode of HIV exposure. WellFlorida’s High Impact Prevention (HIP) project — which includes the Everyone’s Doing It, It’s Everyone’s Business and the ARTAS campaigns — aims to decrease the spread of HIV in North Central Florida while linking those who are already infected to care services. By holding at least 12 free HIV-testing events per month in counties throughout North Central Florida, HIP seeks to serve the populations facing the highest risk factors for HIV transmission. During the testing events, HIV prevention counselors and volunteers provide information, answer questions and distribute condoms and promotional items. 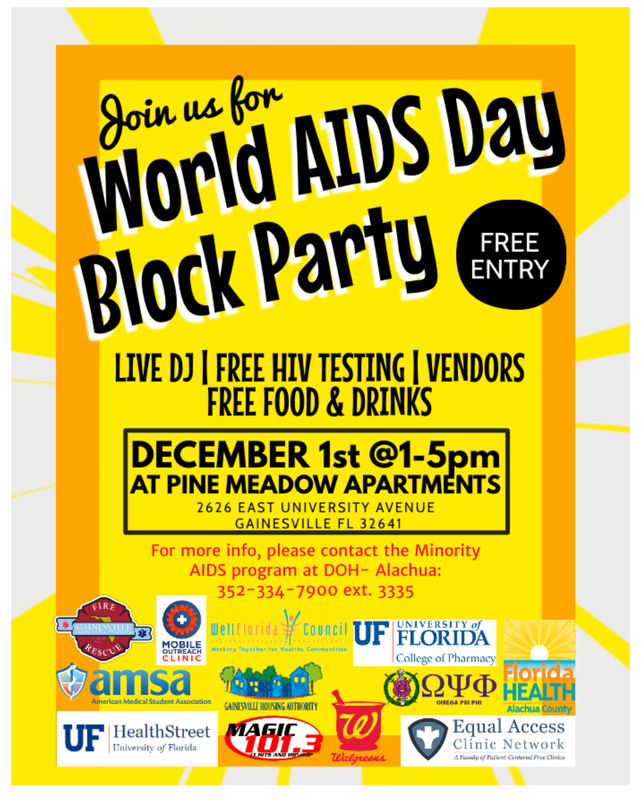 In honor of World AIDS Day, WellFlorida’s HIP will be participating in The World AIDS Day Block Party on Dec. 1, which will include HIV testing. See the flyer below for details. HIP will also be offering testing events throughout the first week of December, visit https://everyonestopaidsnow.org/ for a complete list. ARTAS, which stands for Anti-Retroviral Treatment and Access to Services, is a CDC-recommended, evidence-based program within the HIP project that serves those who are either newly diagnosed with HIV or who are HIV positive and haven’t received medical care for six months or more. WellFlorida has successfully linked more than 85% of clients to HIV-related services. Learn more about ARTAS. In addition to HIP, WellFlorida has a long commitment to serving HIV positive clients through our HIV Care programs. Recently, WellFlorida launched the new website www.HIVCarePrograms.org to educate the public about healthcare and support services for people living with HIV in North Central Florida, resources on how to prevent the spread of HIV and how to stay healthy. The website is a result of a partnership among WellFlorida Council, Ryan White HIV patient care providers in Area 3/13 and the North Central Florida CARE Consortium. It is sponsored by WellFlorida and the Florida Department of Health. Be sure to share this resource with your communities.